Airbnb is a community built on the foundation of trust. A person, a family, or even a business rents out either a shared space, a private room, or an entire place to a complete stranger. You can find anything from the typical apartment or house, to more interesting places like mansions, boathouses, castles, or even tree houses and igloos. Airbnb is available all around the world, and a perfect place is waiting for you at your next destination. You just have to be willing to find it! Account: First, you have to make an account on www.airbnb.com. You can sign up through your Facebook, Google, or email account and you choose whether you’d like to be a guest or a host. You can change to the other later on should you have the need. You have to fill out all the necessary information such as name, date of birth, and phone number. Your phone number, email, and government ID have to be verified before you can continue onto the next steps. Now onto the fun part! There are a few things to consider when deciding between places. It’s going to seem like a lot to take in; however, most of these come with the territory of booking a trip. Dates: Obviously the dates in which you are travelling are going to affect the availability of accommodations. During certain times of the year, the rate may increase or decrease depending on the demand for that time. Some individuals may have weekly, or monthly, rates. Location: If you have a specific destination in mind, plug it in and it will pull up all the available homes in that city, as well as nearby surrounding areas. Some locations are pricier than others, so I think it’s great to check out the neighboring areas. If you have a car at your disposable, or easy transportation (i.e. buses, trains, bikes. etc), I would recommend giving it a fair shot. If you just want to get away, but don’t necessarily know where, ‘anywhere’ is a location option and you can just pick from the places that pop up! Type of Room: Like I said before, you can choose to book either a shared space, a private room, or an entire home. If you’re booking a trip for only one or two people, and don’t potentially interacting with your host, a shared space or private room may be the way to go. If you’re booking for friends getaway or a family reunion, you may want to look into booking an entire home. You have the ability to filter your results by the number of bedrooms, beds, and bathrooms. If that’s not important to you, then there’s no need to change it from the default of any. If it is important, then add how many you need of each to update your results. Price: The price range can be anywhere from $10 – $1000+, but ultimately it’s what you decide is best for you. You have the option to go in and change the range to suit your budget needs. The price is dependent on the location, the type and size of room/home, and the amenities it includes. Cleaning and service fees are also included, and depending on the location, it may include an occupancy fee. Should you be bringing a pet with you, that may require an additional fee as well. The good thing is the price is broken down for you, so you can see how the final total was reached. Make sure to only use the Airbnb website to conduct any and all financial transactions, as there will be record of it should anything go wrong. Cancellation Policy: There are three types of cancellation policies that can be associated with a booking: strict, moderate, or flexible. A strict cancellation policy entails the guest may cancel up to 7 days before the trip and receive a 50% refund + service fees returned. A moderate policy states a guest may cancel up to 5 days before the trip and receive a full refund, including the service fees. The flexible policy reads a guest may cancel up to 24 hours before the trip and receive a full refund + the service fees returned. My recommendation is to find a place that has a flexible cancellation policy, especially if you’re booking way in advance. Life has a way of throwing unexpected twists and turns, and the flexible policy would be the easiest to manage should anything happen to prevent your trip from occurring. Of course sometimes you find an amazing place that you want to stay at, and if that’s the case, stay there! Just make sure you’ve read and fully understand the cancellation policy as stated on the site, and it doesn’t hurt to confirm with your host either. Reviews: I think the reviews are the most important! Travellers tend to help other travellers, so I believe most reviews are honest and helpful. I never stay at a place that doesn’t have great reviews, let alone any reviews at all. That’s just my personal preference. You might want to take the chance and be the first person to leave a review. You’ll also come across hosts that have an orange and coral-ish looking badge on their profile. These individuals are recognized as being ‘super hosts’ for going above and beyond for their guests. I personally have not had any bookings with a super host, so I would still recommend reading the reviews. After you stay with your host, you will receive a request to leave a review about your time specifically regarding your accommodation and your host. I believe you have 7 days to leave the review. Make sure you leave a review. Not only does it help other travellers, but it also helps the host. Please note, the host will also receive a request to leave a review on your profile as a guest. These reviews build your credibility in the community and people will be more likely to let you into their homes if they see positive reviews. Amenities: You will also have the option to filter through homes using amenities. If you’d like to be able to cook in the house during your trip, make sure to check the box for kitchen. If you’re driving to the location, and would like to make sure it has a guaranteed parking spot, check the box for parking. There’s many you can check such as washer, dryer, TV, hangers, air conditioner, heater, and many more. The amenities I usually check off that I need to have are essentials (i.e. such as towels and sheets), and WiFi. Miscellaneous: Before you request to book a place, make sure to read the house rules and ask if you and your guests will be able to follow them. You should also take time to read the host’s profile in detail. Usually they will state how much interaction they will have with their guests. You want to make sure you both are on the same page on that one. After you request to book, the host has 24 hours to agree to have you. When that time has passed, it automatically declines your request. There is an option of instant book, which is easily recognized by a lightning bolt next to the price. This indicates having the ability to book the place without having to wait for the host to respond. I have yet to use the instant book feature, so I can’t comment on that. It seems pretty convenient though, especially for last minute, unexpected trips. Well, there you have it! A guide to finding the right Airbnb for you. I hope this post was able to help make your next Airbnb transaction a bit smoother. I’ve had great trips using this service, and I’ve meet some incredible people, and I hope the same happens for you! Do you have any experiences using Airbnb? I’d love to hear about them! **As of recently, Airbnb now offers “an experience”, where people can book food tours or museums trips, and much, much more. I haven’t had the opportunity to try it out yet, but it seems like a great idea. I’d also love to hear from people who’ve tried out the ‘experience’ feature! Our family has outgrown hotels we we really need to get savvy with this. Thanks for reading! I’m so happy to hear that they were helpful. I’m a big fan of Airbnb as well, and I’d love for people to have the opportunity to have the same experience! This is a very helpful post for the first time Airbnb users. Especially to pay attention to the various cancellation policies. Thank you! And yes; my mom was the one who actually caught the cancellation policies the first time I ever booked through Airbnb. It’s super easy to not realize there are three levels. Thanks for reading! i think reviewing reviews really help + house rules are super important, with pets and such. Yes, I agree. Personally I think the reviews are the most important because you get an idea of what the host is truly like, and how the accommodations are in comparison to the pictures. Thanks for reading! I love using Airbnb, and these are some really great tips for anyone getting started with them! Thank you for the kind words! And glad to see a fellow Airbnb-er. Haha 🙂 Thanks for reading! Awesome post! Me and my hubs are getting ready for our first big trip and are planning on using airbnb so this was super helpful! I was a little nervous about using them, but it seems that there is nothing but positive reviews! What a great, comprehensive guide to AirBnb! I tend to stick with AirBnb or hostels when I’m out and about, sooo much better and cheaper than hotels!! Yes! Sometimes hotels are nice, but overall Airbnb for the win. I have yet to stay in a hostel, so that will be my next adventure in lodging! I love reading tips like this. Because I’m not a well travelled person. But in the next few years my family and I will be taking trips. These are really helpful! Thank you. I’m so happy these tips will help you out 🙂 Thanks for reading! oh experiences sound interesting! I’m gonna have to check those out. I have never heard of Airbnb. This was a great guide since I had never heard of this. It does sound like a better option than a hotel. Definitely will look into this when we take a vacation. I used AirB&B once in NYC and was so disappointed. I wish I had seen this guide beforehand. I may give it a second go now. I am usually not the one booking the trips, but I certainly should tell me parents about this handy dandy thing! Thanks for the suggestion! Thanks for this! I’m staying at an Air BnB for the first time in a few weeks and this is very helpful. Thanks again for sharing! I absolutely love Airbnb’s the experience is nothing like any hotel, it’s more person and there is a sense of warmth that one gets in some of these homes. Yes, exactly! And you have the potential to meet incredible people who could be willing to show you around the city/wherever you’re staying! An informative summary. I haven’t used Air BNB yet but we are planning a trip abroad next June and this will be helpful. Thank you, this was very informative, I’ll have to use it the next time we go on vacation. Thank you for reading 🙂 and yes, I definitely recommend you try it out..at least once! I am just learning about airbnbs and their popularity seems to be growing. 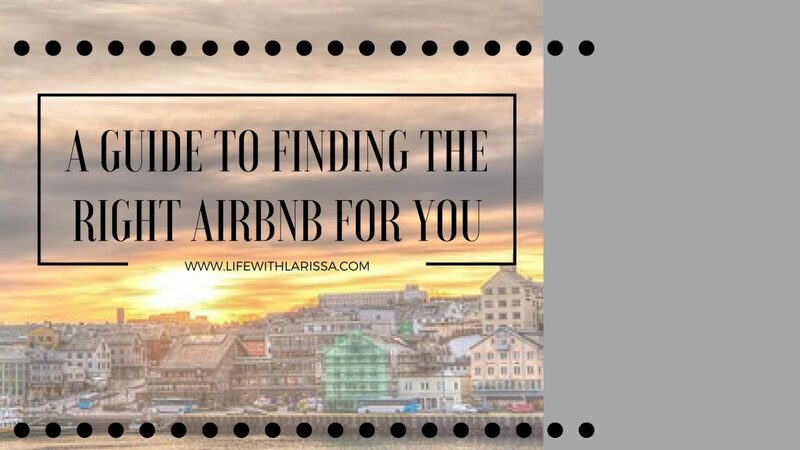 This articles was very indepth and it will certainly assist me in getting acquainted with airbnbs. I’ve never stayed at an airbnb before, but I hear great things about it! Will have to look for one on our next trip! You should definitely try it to see if you like it! I’ve had incredible experiences at the ones that I’ve stayed at! Thank you! We have yet to book an AirBNB but am glad to have these tips for the future! Next Next post: 5 Hidden Gems Found in South East U.S.